It is our great pleasure to invite you to the 8th International Conference on AFM for Life Sciences and Nanomedicine (AFM Biomed 2017) to be held in Kraków, Poland, from 4th to 8th September 2017. The Conference co-organizers are the Institute of Nuclear Physics of the Polish Academy of Sciences and the Jagiellonian University. The conference will provide a forum for colleagues from both academia and research institutions throughout the World to exchange results and new ideas on use of atomic force microscopy (AFM) and related techniques in life sciences and medicine ranging from cell or molecular biology to clinical applications. The conference will cover advancements of scientific knowledge from fundamentals to applications. Discussions on present possibilities and future developments of the technique, in view of the future requirements coming from technology and basic research, will be particularly solicited also with dedicated discussion time. The program of the Conference will be organized into 4 topics dedicated to Cellular Mechanobiology, Bioimaging, Molecular Forces, and Health & Disease. Low student's conference fee and inexpensive housing at the University dormitories will be provided to strongly encourage students to participate in the meeting. 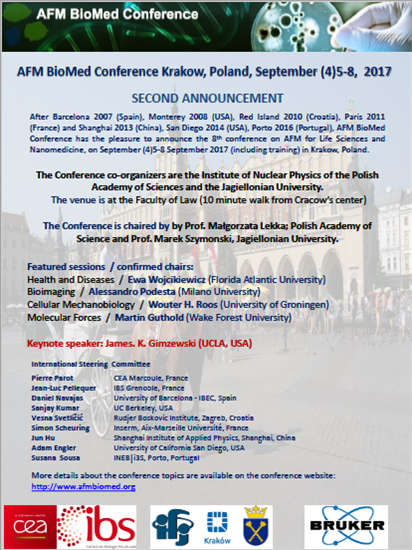 We cordially invite you to attend AFM Biomed 2017 in Krakow. We hope that you will enjoy not only the scientific atmosphere during the conference, but also a beautiful city with its outstanding cultural heritage and current cultural activities! Prof. Marek Szymonski, Marian Smoluchowski Institute of Physics, Faculty of Physics, Astronomy and Applied Computer Science, Jagiellonian University, Krakow, Poland. The 8th AFM BioMed will be followed by the 21st conference on Secondary Ion Mass Spectrometry, SIMS21, which is held in Kraków, September 10-15, 2017.